In simple terms, Vitamin C is an essential beneficial nutrient that helps manufacture compounds vital to maintain certain chemical activities within the body. Vitamin C is water soluble, meaning that your body cannot store it, requiring vitamin C intake on a daily basis. Vitamin C is also known as Ascorbic Acid, which is a general term for Vitamin C, but also refers to pure vitamin C (single entity Ascorbic Acid) that is not bound to any other compound. We need vitamin C to aid growth and repair tissues in every part of the body. Ascorbic acid is needed to heal wounds and for maintaining and repairing teeth and bones. Another vital role vitamin C plays is in helping with the production of collagen proteins. These aid the manufacture of skin, tendons, cartilage, ligaments and blood vessels. Vitamin C is widely known as an antioxidant. A build up of free radicals over a prolonged period of time may add to the ageing process and unwanted health conditions. Antioxidants can block damage caused by free radicals. Ascorbic acid also assists the body to absorb iron. Many people believe that vitamin C can cure the common cold but the scientific evidence for this is conflicting. 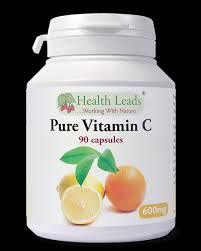 It is well documented that vitamin C may help prevent a cold if you are deficient in ascorbic acid. Also, vitamin C supplementation may be useful in preventing a cold if you live in low temperatures or if you are involved in regular vigorous exercise. Ref: Douglas RM, Hemilä H, Chalker E, Treacy B. Vitamin C for preventing and treating the common cold.Cochrane Database Syst Rev. 2007 Jul 18;(3):CD000980. The most known deficiency in vitamin C is the disease scurvy. This disease is very rarely seen today in healthy adults but can affect infants and the elderly. Each capsule is crammed full with 600mg of 100% pure ascorbic acid, free from any additives. Many supplement manufacturers use other forms of vitamin C that are bound to other compounds. For example, buffered vitamin C is bound to calcium, magnesium, or potassium. We believe that pure ascorbic acid is the best form of oral vitamin C supplementation. When we go food shopping, we are more than ever aware of the need to check food labels for unnecessary or unwanted additives. The same can be said for supplements. Supplement labels need to be checked for unnecessary and harmful additives. Today many supplements contain a lubricant called Magnesium Stearate. Many manufacturers add this purely to make to their machines run faster and to save money. However, magnesium stearate is believed to inhibit the absorption of nutrients. So, next time you are shopping or buying on-line, please check the label. Health Leads are a Welsh company. We encapsulate pure vitamin C in a plant source vegetarian capsule without using additives or magnesium stearate.